Careers Cost > How Much Does a Booth Rental Cost at a Hair Salon? How Much Does a Booth Rental Cost at a Hair Salon? 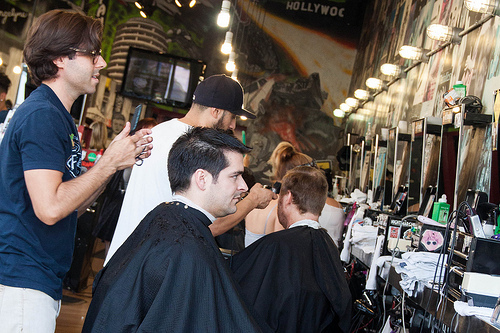 Renting a booth at a salon is a great way to start your career as a hair stylist. These booths are basically inside a building with a lot of small rooms that can be rented for a single hair stylist. These rooms are usually fairly small but are large enough to accommodate one hair styling chair, a closet for supplies, a counter, a mirror, and a table or counter of some sort for checking people in and out. There is usually a waiting room at the front of the salon where the customers can wait. On average, plan on spending at least $75 to $400 per week for a booth. The higher end will be for your upscale salons, while the lower end can be for the areas with less foot traffic. You may also pay more if your booth is at the front of the salon rather than the back. Busy and higher-end rent districts such as Manhattan could charge as much as $1,000 per week for a booth rental. A forum thread on BehindtheChair.com claims that you should budget for $75 to $300 per week for your booth. Again, it comes down to your location. On this Indeed.com thread, they had talked about what they had paid and they said you should budget about $150 to $200 per week. Forum members on this BeautyTech.com forum thread talked about what they paid, and according to the thread, most prices ranged from $75 per week to more than $400 per month. With the price estimates mentioned above, it should include the booth inside of the salon. Essentially, you are renting your own office space that you can market to your clientele. A booth rental at a hair salon in metropolitan areas may be higher than a rural area with very few people. If you are going to rent the booth for a year rather than six months, some salon owners may give you a lower rate. Some salons require you to pay extra for electricity and water charges. Also, salon owners may charge you extra if you are going to use the salon on Sundays or other days that are not normal business days. Depending on the salon’s policy, some may charge a referral fee for walk-in customers. This means that if the customer waiting does not have a regular stylist and is looking for a new stylist, the receptionist can refer them to you. You may then have to pay a percentage of that first meeting to the salon. Some salons may charge tax on top of your monthly fees. Other expenses you may want to think about can include advertising, personal insurance and supplies. If you are a hairstylist fresh from a hairdressing school, it is a better option to work in a salon. That way, you could hone your skills and clientele enough to make you more confident. Build an outstanding relationship with your clients, and they will most likely follow you wherever you go. In time, they will visit you at your own booth. Make sure to show up at the salon on time and bring out the best service you have for your client. Always have a business card with you. That way, clients can refer you to their friends and family. You could even give a discount to the customer that refers you. Know the salon’s policies for the rented space. Decorate your space to make it your own. The more personalized and relaxing your booth is, the more likely people are to come back. Am I allowed to use the salon on Sundays? How many days do I get to use the booth? How many hours am I allowed to use the booth? Are there other charges I need to be concerned about? Is the booth available for rent monthly or weekly? Are there any terms of renting the booth? What is the percentage of every client’s fee? Consider renting a booth only if you have a large scale of client contacts. Imagine yourself renting a booth for $100 a week and you only have one client. Do the math to make sure that it is something that will benefit you. If you live in a popular area, call around and ask for booth rental prices. Most salons will offer free tours and are more than happy to give you a quote over the phone.